We all remember the good old classic horror films. Spaghetti intestines? That stuff was classic! Now, you can give the gift of horror to your local horror buff with fake million dollar bills, printed with legitimate imagery from some of the best horror films ever created. Now, thanks to the guys at fakemillion, you can own a little reminder and souvenir of these great movies that are icons of American cinematography. These bills are great gifts for yourself or a friend, and they remind us of movies that keep us up at night! There’s something so special about these old movies. Who could forget, The Creature from the Black Lagoon? That movie was great! And now there’s Creature from the Black Lagoon novelty money! What a pleasant occurrence! And what about the famous story of Dr. Jekyll and Mr. Hyde? Another classic story, portrayed for us on film. This bill is sure to please any horror fan, and any fan of the classics too. Of course, nothing quite says “Horror” like Dracula. Dracula was the first, “Original vamp” movie, showing us the true fear and fright incarnate that is a vampire. Dracula is something we all remember quite well, and this may yet be one of the best horror movies out there. Now, you too can have a fake million dollar bill with Dracula on it, or you can buy a few of them and give them to all your vampire fan friends too! Frankenstein’s Monster. Does it get any more classic than that? Probably not! We all remember this classic, as we can all relate to it too, especially first thing in the morning when we haven’t had our first cup of coffee yet! This movie too is preserved forever on its very own fake, million dollar bill. These fake million dollar bills are great gifts too. Heck, you can get a few for yourself, and then get a few for your friends too. And they only cost a buck a piece too, so the price is just about unbeatable. There are many other horror bills to pick from too, from The Hunchback of Notre Dame, Phantom of the Opera, the Mummy, Wolfman, and the Invisible Man. Also, if you’re having a horror movie marathon, why not give these out as party favors too? They’d be great for it! 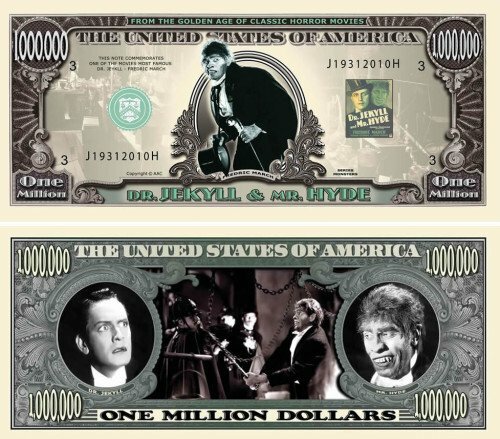 This Horror Movie Million Dollar Bill serves to recognize Dr. Jekyll and Mr. Hyde! Part of our special Horror Movie Classics Collection.